Biophysics solves biological problems using a combination of chemistry, biology, physics, mathematics, and computer science. Learn in state-of-the-art facilities at one of the first institutions in the country to establish biophysics as an independent discipline. Graduate students can participate in the Program in Molecular Biophysics (PMB) and the Program in Cell, Molecular, Developmental Biology, and Biophysics (CMDB), which offer a PhD in biophysics-related research. The Thomas C. Jenkins Department of Biophysics has a long tradition of excellence in research and teaching and of developing leaders in the scientific community. The department offers an undergraduate major and participates in two graduate programs: the Program in Molecular Biophysics (PMB) and the Program in Cell, Molecular, Developmental Biology, and Biophysics (CMDB). 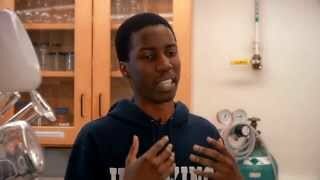 Biophysics major Quenton talks about why he chose Johns Hopkins and what he loves about his major.